It has been argued for decades when did the muscle car revolution start some say with the G.T.O. or was it in the summer of 69. Let's go back to the early 60's With the Impala's of the day from Chevrolet Or the 300's From Chrysler. In The Ford Division The Galaxy was new on the horizon just launched in the late 50's Ford Had a New Slick Body To Stick a Big Motor In and with the 500 series you could go from mild to wild. The most popular 390 was the Z Code Thunderbird 390 Special, rated at 300 horsepower at 4600 rpm, 427 lbs-ft of torque at 2800 rpm and with 9.6:1 compression and a hydraulic camshaft. A single 446 cfm 4-barrel carburetor was mounted on the traditional cast-iron intake manifold. The engine block and cylinder heads were black in color with silver valve covers and air cleaner. Fords originally equipped with this engine carry the "Z" engine code on the data tag. What made this motor so popular was it had a Hydraulic Cam Over The Police Interceptors Adjust the valves every month at the shop. With both P and Z code cars producing 427 Pounds of torque it was a no brainier for the buyer of the time. Remember what win's on Sunday sell's on Monday and Ford did a lot of winning. 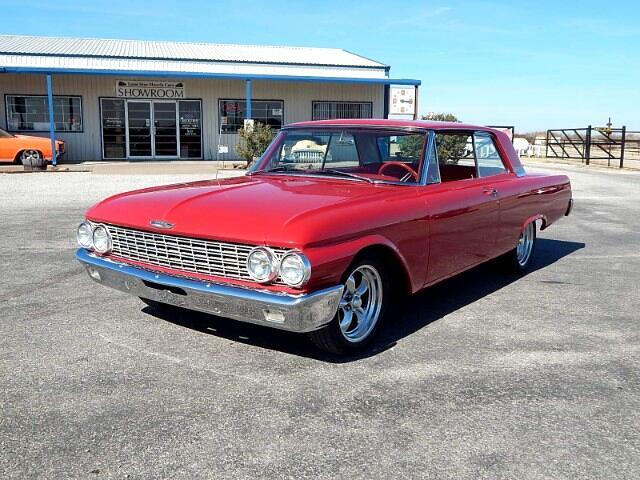 Lone Star Muscle Cars Is Proud To Present This Super nice Show Quality 1962 Galaxy 500 Club Victoria Hard Top Coupe. This is a number,s matching 390 motor the original three speed transmission has been upgraded to a four speed Manuel in the floor. To Make This Car more enjoyable to drive the following options have been added. Under the hood you will see all new Power steering System From the all new chrome tilt column to the gear box. All New Heat And Air system for those hot and cold nights. On the Interior you will see all new bright red leather interior Chrome Tilt Column Custom Steering Wheel a super nice interior. On the exterior you will notice show quality paint with Chrome Wheels with new tires. This car has an awesome sound with it's duel exhaust system. If you are looking for that rare and cool early muscle car here it is.